Over 20,000 people are attending Microsoft Ignite this week, where we are all busy attending and giving sessions, meeting partners and friends, and generally making sure that we are well plugged into the technology community. Paul Cunningham, our co-author and esteemed web master of exchangeserverpro.com, isn’t with us but has promised to join us at IT/DEV Connections in Las Vegas next September. But sad as it is to be without Paul, his absence won’t stop us celebrating the launch of our new eBook Office 365 for Exchange Professionals with some spirit this week. You can reserve your copy of the eBook from exchangeserverpro.com now, but if you’re at Ignite, you might like to try and secure a copy from one of the partners who have helped us deliver the book. Microsoft is our most important partner. 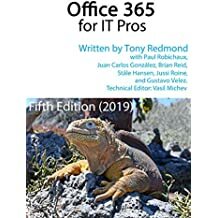 We received a huge amount of help and support from the Office 365 engineering teams as we built the content of the book and Microsoft has 600 copies for distribution at Ignite. Even though we always intended the book to be an electronic consumable (we provide PDF and EPUB files from exchangeserverpro.com), Microsoft arranged for 200 special printed copies. This isn’t just a matter of printing off the PDF; Microsoft arranged for a printer to do a limited print run, just as if we were doing a traditional book. Some people prefer printed books to electronic versions and these copies will be unique. Getting hold of a printed copy might be challenging, but here is how you can secure one. We will have the formal launch of “Office 365 for Exchange Professionals” at 12 noon on Monday, May 4 at the “Geek Out” space under the large Office 365 sign in the exhibition area. Jeff Guillet (the technical editor for the book) and I will be there to celebrate the first edition of the book and will be giving away one hundred printed copies to those who join us. Another 400 copies are available on USBs and will be distributed at my “Bumps and Blips on the Road to Cloud Nirvana: From On-Premises Microsoft Exchange to Office 365” (code BRK2164) at 1:30PM on Thursday. The problem here is that nearly 900 people have registered for the session. 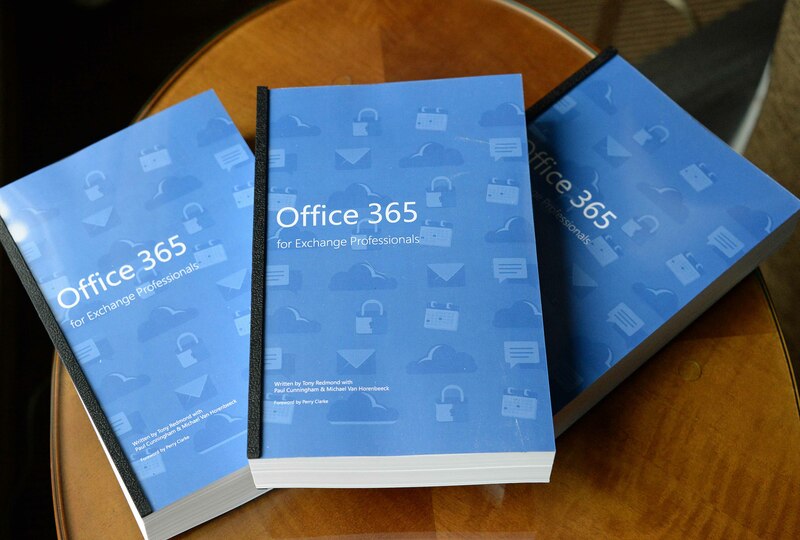 Clearly we can’t distribute 400 to 900 so Microsoft has stepped up to the plate to guarantee that everyone who comes to the session will receive either a USB containing the book or a voucher for a 1-year subscription to Office 365 Home. 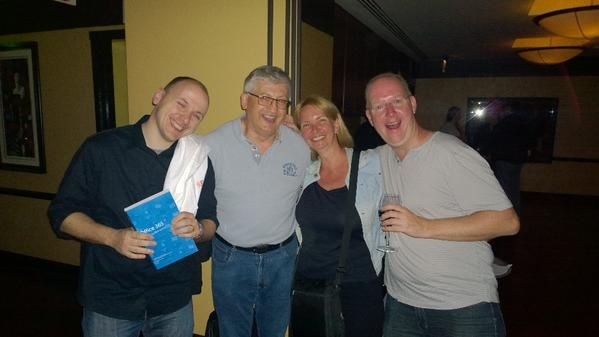 We’ll be running the final of the MEC Trivia Quiz at the ScheduledMaintenance party on Tuesday night. ENow is sponsoring a grand prize of $1,000 for the person who is best at answering the quiz questions about anything to do with the history of Exchange. It all promises to be an interesting evening. Our partners have a limited number of PDF copies and copies are likely to go fast. You’ll need to buy a copy from our site if you want an EPUB version of the book to read on iPad and other eReaders. 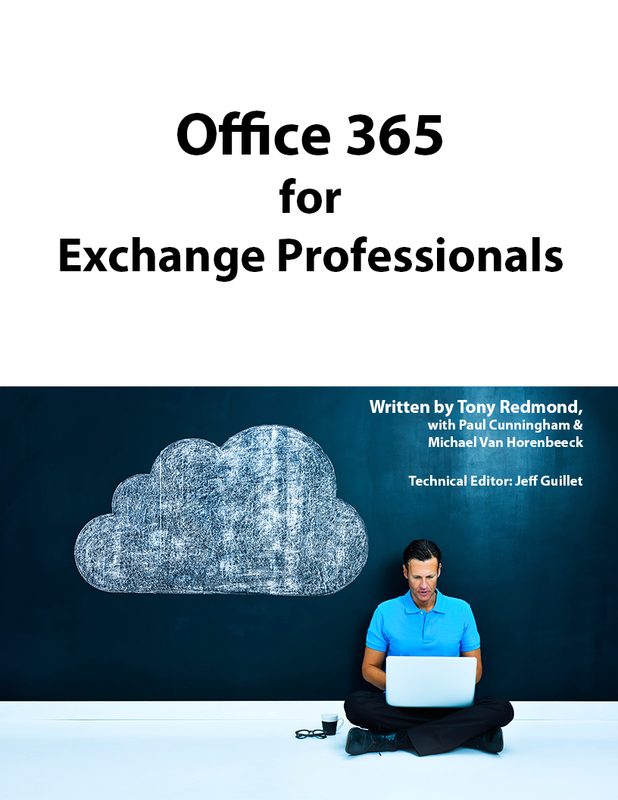 As I explained when we announced Office 365 for Exchange Professionals, we have chosen the eBook route because it allows us to keep pace with the development cadence of the cloud. Anyone who has tracked the announcements of new features and capabilities made on the Office blog over the last few weeks will understand the challenge involved in updating text to match what is delivered to Office 365 tenants, but we’re going to give it a go. The first update of the book is planned for release in September and we’ll probably launch it at IT/DEV Connections at the Aria Hotel in Las Vegas. As noted above, Paul Cunningham can’t resist coming over to a conference in Sin City, so the entire team will be there to celebrate. This entry was posted in Office 365 and tagged ENow Software, MEC Trivia, Microsoft Ignite, Office 365 book, Office 365 eBook, Office 365 for Exchange Professionals, TransVault Software. Bookmark the permalink.